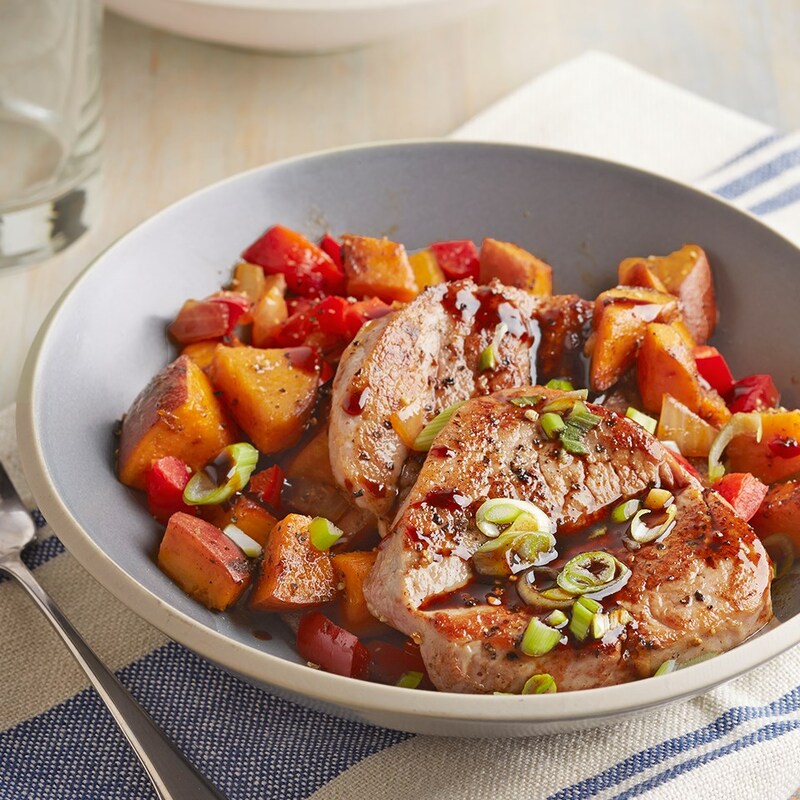 Chunks of sweet potato and sweet red pepper simmer with pork and Asian seasonings for a tasty, budget-friendly meal that's perfect for weeknights. 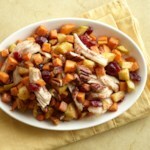 Place sweet potatoes in a medium microwave-safe bowl with 1 Tablespoon water; cover with vented plastic wrap. Microwave on 100% power (high) for 8 minutes, stirring once. Carefully remove plastic wrap; set aside. 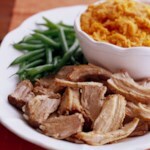 Meanwhile, to butterfly pork slices, cut three-quarters through the side of each; open and flatten slightly. 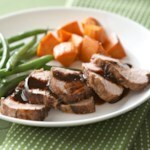 Brush with 1 tablespoon of the soy sauce; sprinkle with black pepper. In a very large nonstick skillet, heat 1 tablespoon of the oil over medium-high heat. Add red peppers and onion; cook until just tender, about 4 minutes. Stir in garlic and cook 30 seconds more. Remove from skillet and set aside. 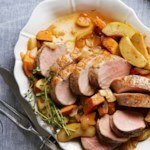 Add pork to the skillet. Cook for 4 to 6 minutes or until browned and slightly pink in centers (145°F), turning once. Remove pork; cover to keep warm. Add remaining 1 tablespoon oil to skillet. 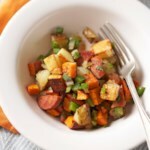 Add partially cooked sweet potatoes to the skillet. Cook for 5 minutes or until potatoes are tender and well-browned, stirring occasionally. Add red pepper mixture; heat through. 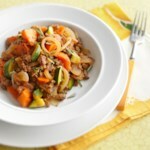 Spoon hash onto plates; top with pork. For sauce, whisk together remaining 3 tablespoons water, honey, and the remaining 1 tablespoon soy sauce. Remove skillet from heat; add sauce mixture and heat until boiling. Drizzle sauce over pork. Top with green onions.